Whenever I get my dry cleaning done, I come across new restaurants which always seem to be busy. Pizzeria Brandi is next door and had a bunch of huge neon signs that drew my attention. After realizing they sold pizza by the slice, I figured I would give it a try. The pizza is pre-boxed and kept in a warmer. So if it was your first time at the restaurant, you also wouldn't know if they were deep dish or thin crust slices. You also don't really know the freshness of the slices. Anyway, you get what you pay for, which in my opinion was a greasy slice of pizza. It was decent size for lunch time meal. The restaurant itself is a little on the darker side, but it has a typical pizzeria feel. Nothing too fancy. Anyway, I just couldn't get past the grease or the tough, chewy crust. And, for that reason I could think of many other pizza places to visit... a 2-mile rating seemed fair. I saw the "pizza by the slice" sign and had to give it a try. They offer the staples... cheese, pepperoni, sausage, or spinach thin crust slices at a reasonable price. I chose the sausage. The pizza slice is crammed into a small slice box lined with wax paper. Immediately, I knew the wax paper meant the pizza would be extremely greasy and I was STILL caught off guard with the amount of oil sitting on top of the cheese (Picture is after using the napkin as a sponge). The crust itself is definitely on the thicker, tougher side and has that typical "cardboard-like taste" that most places have that sell by the slice. - Pizza by the slice for $4.00... if you are in a hurry, I guess it is worth it. - Too much grease. Don't eat the pizza in your car. You need a fork and knife. How far would I walk for this food? I have mentioned several times that finding an authentic Italian restaurant in Chicago is somehow much harder than expected. Many of my friends agree, especially the ones that have lived in Italy or travel their on a yearly basis. Anyway, it was my friend's birthday and she decided on Volare. It was my first time to the restaurant, but with such great recommendations from her and her family/friends, I was optimistic. On a Thursday night, the restaurant was packed. The restaurant was on the darker side and extremely loud. But, this is what you can expect in most Italian restaurants in the city. The food was served in HUGE portions. I think some of the quantity takes away from the quality of the dish. Pastas are shareable as are the meat dishes. They have a great selection of wine and cocktails. Some of their dishes were just not as appetizing as I hoped. Some where great, while others mediocre at best. And for that reason, I think the 4-mile rating may be on the generous side. But when compared to some of the other restaurants in Chicago, I didn't feel comfortable rating it lower. We decided on a couple orders of Volare's calamari to share as appetizers. Their version is heavy on the breading before being deep fried. It is served with lemon wedges and both a spicy tomato and cocktail sauce. I was very disappointed with this appetizer. There was nothing unique about it and the breading was too thick. It tasted like any other deep fried dish. The cocktail sauce is still the better of the two dips, but you can't really mess that part of the dish up. Probably wouldn't order again. As our third appetizer dish, the group agreed with the birthday girl's pizza choice. She wanted to try the salsiccia pizze. The pizza crust was thin and topped with a San Marzano tomato sauce, sausage, mozzarella and parmigiano cheese, and red pepper flakes. The crust is cooked in a special pizza oven... unsure if it is wood fired or not. Regardless, the crust had that crisp, burnt texture that reminded me of Italy. The toppings were great, but the red pepper flakes sort of ruined the pizza. I couldn't believe they would pre-sprinkle the red pepper on the pizza. It made the pizza look more generic and "Americanized." I think for the cost, a higher quality ingredient can accompany the rest of the great toppings. After scanning the menu several times, I decided on ordering the same dish as the birthday girl and several of her family and friends. And, I was glad I did. The spaghetti neri al pesce is a black spaghetti dish, meaning the black squid ink is mixed in while the noodles are made. These black noodles were topped with several shrimp, lumps of crab meat, a few scallops, and a brandy and cream rose sauce. The pasta was excellent. It was cooked perfectly and had an interesting, yet delicious fishy taste. The squid ink flavor was not overwhelming and was complimented nicely by all the fresh seafood and the creamy tomato sauce. The pasta dish is huge; in fact, it is shareable. I highly recommend this dish. I was torn between this dish and the dish I ended up ordering. Luckily, one of my friends sitting next to me decided on ordering it, meaning I got to sneak a bite. Her pasta dish was made with the fusilloni pasta and then topped with a veal ragu, porcini mushrooms, peas, pecorino cheese, and a cream sauce. That veal ragu grabbed my attention immediately. You can tell it was cooked down for several hours with the mean extremely tender and flavorful. The addition of the mushrooms and peas added both a visually appealing element and depth in flavor. The pasta was a little on the "soupier" side, but I really enjoyed it. Another dish I would definitely recommend. One of my other friends choose the veal parmesan aka vitello al parmigiana. A veal cutlet was pounded thin, breaded, and pan-fried before being topped with a pomodoro sauce and a healthy helping of mozzarella cheese. It came with a side of spaghetti to make this dish just as large as the other entrees. Personally, I am a huge fan of "meat parmesan" dishes, but something was off on this dish. It was definitely on the oily side, and all I could taste was breading. It was tender, but that is expected after the cutlet was pounded thin. My favorite cocktail is the sazerac. 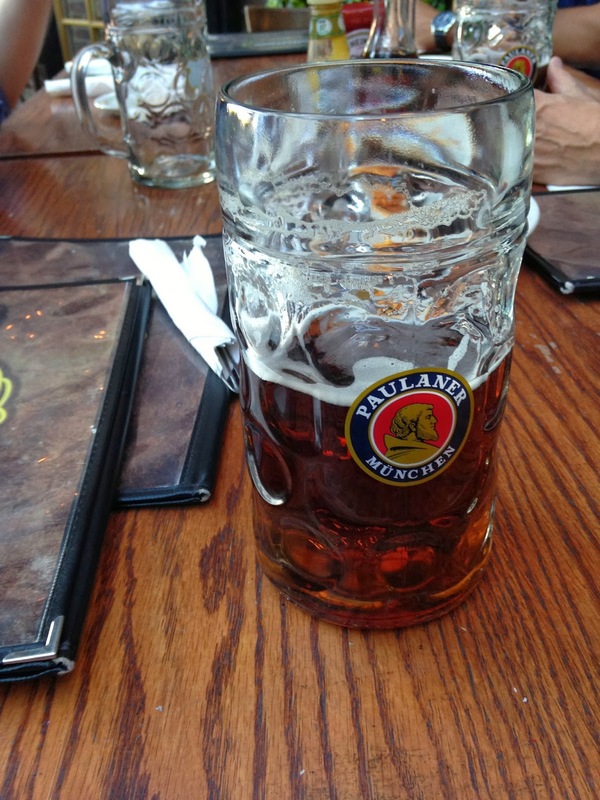 Unfortunately, many bars in Chicago are surprisingly unsure what is in it. Luckily, the bartender at Volare knew, even though the waitress didnt. The drink is made with a rye whiskey, a swirl of absinthe, simple syrup, bitters, and a lemon peel. It was made well, maybe a little overpowering on the absinthe, but it was still tasty. - Valet parking is very reasonable at $10. - The dishes are huge. Sharing a pasta dish is definitely a possibility. I was full with more than half of mine remaining. - Their specialty is their gnocchi entree. I forgot to take a picture, but the gnocchi is great. Huge portion, nice potato flavor, great consistency. - Don't forget to make reservations here. It was packed even on a Thursday night. Don't eat too much of this bread. It comes out warm and is hard to resist. With several locations throughout the city, the Goddess and Grocer has been serving "specialty" sandwiches, salads, and desserts for a while now. They offer the healthier option at meal times, but it comes at a cost. Their sandwich creations, which involve thick cut deli meats, premimum ingredients, and interesting condiment combinations, will cost you about double the going rate of a sandwich in Chicago. At double digit prices for a sandwich with chips... And no cookie or drink included... the prices are a little steep for a students budget. The food is tasty, but I just couldn't get over the cost-to-food ratio, and that is why I only gave it a 3-mile rating. Rather than the typical deli sandwiches you find across Chicago, the Goddess and Grocer offers interesting combinations that appeal to many. I choose the Turkey Twist sandwich on my first visit and was unfortunately, a little disappointed... not from the sandwich itself, but a few other aspects I will dive in to shortly. But, first, this sandwich creation was made with roasted turkey breast, caramelized onions, swiss cheese, lettuce, tomato, and a cranberry mayonnaise. It was elegantly placed on their country white bread before being sliced in half. The sandwich itself was visually appealing and hunger satisfying. The turkey was thick sliced and that cranberry mayo had enough tart to counter the sweetness of the caramelized onions. The other ingredients were staples and I thought acted more as a filler. The part I disliked was the cost. At $8.00 plus tax, the sandwich doesn't even come with chips or a cookie. And for that cost, the sandwich isn't even that filling. - If you are in the area and craving healthier food option, this may be the place for you to stop and try. - Order their cookies. They are delicious! - Parking is crazy around this area, so don't drive. In the city of Chicago, I find it hard for pizza places to make a name for themselves, especially with all of the deep dish king pins running the show. After trying a slice of Piece, everyone will understand how and why a place without deep dish can survive in the city. This brewery and pizzeria features plenty of premium pizza ingredients that compliment their great beer prices. The place is always packed and can get a little rowdy, especially during sporting events. I always enjoy ordering the pizza for take out, especially with it's location being impossible to park around. The prices are a little steep for the pizza, which will discourage many potential customers, but if you just give it a try once... you will be hooked. Since the prices are high for students, like myself, I decided a 4.5 mile rating would be more reasonable. If they could somehow offer a weekly special or something to cut down the cost, a perfect 5-mile rating would be given. After deciding on the style of pizza, you essentially have the freedom to create your own pizza from a huge variety of both premium and regular toppings. With premium toppings costing $2.00 each and regular ones at $1.75, the cost of the pizza adds up fast, but it is definitely worth it. We created a red pizza with spinach, sautéed mushrooms, italian sausage, and BROCCOLI. The red pizza already has the traditional marinara sauce and mozzarella cheese. All I can say is WOW. This pizza is without question some of the best thin crust pizza around. The crust itself isn't super crispy, but it somehow still supports the generous toppings Piece uses. I do love how Piece doesn't just have a set "total" amount of toppings... rather than splitting the toppings evenly so it barely covers the pizza, if you order let's say sausage and mushroom... you will get the exact same amount of sausage if you ordered just a 1 topping pizza and enough mushrooms as if you ordered just mushrooms. It is incredible. For those who dislike tomatoes or are allergic tomatoes, they also offer a white or sauceless pizza. Their standard crust is brushed with a little olive oil before being topped with diced garlic and mozzarella cheese. Then, it is once again off to your imagination for toppings... we choose meatballs, bacon, green peppers, and onions for this pizza which was incredible. The crust was crispier because the sauce didn't have time to make it soggy. The cheese had more of a burnt texture to it. And, the combination of bacon with green peppers and onions just made the pizza. It reminded me of a crispy, flat breadstick. My dad was in love with this option. Definitely worth trying! If you can't tell already, this place is without question the best non-deep dish pizza in Chicago. I won't bore you with how amazing I think this pizza is again... instead, here are the toppings for this creation. Maybe use it as inspiration? Broccoli, artichoke, sausage, red onions, and spinach. I am addicted to broccoli on pizza! - Add broccoli to your pizza. I promise, it is the greatest topping! - Driving to this area is dumb... parking is impossible. Don't do it. For one of my away rotations, I had the opportunity to visit Peoria, Illinois. This smaller city, located in central Illinois, is much bigger than expected and full of great food, friendly people, and of course, a wonderful hospital. I stayed in Peoria for 4 weeks, but somehow, I only managed to eat out a few times. Was it because I was addicted to the hospital cafeteria? Who knows... Anyway, I was very happy with the few meals I did try and will hopefully be back to experience some of the other locals' recommendations. sampler. The Cuban sandwich was incredible. It was a great combination of pulled pork, caramelized onions, melted Swiss cheese, and a chipotle BBQ sauce. Honestly that BBQ sauce is one of the best I have tasted. Great smokiness to it. The appetizer platter had hummus, spinach artichoke dip, and a pico de gallo. All were standard, average appetizers. Everywhere I went, I heard people talk about spotted cow. I initially thought it was a reference to the Wisconsin beer, but I soon found out it was a "better than fast food" fast good joint. I ordered the tenderloin sandwich which was more like tenderloin with a side of bread. It was a huge sandwich with not much flavor except fried breading. I suggest adding mustard to it and their tomato chutney. That chutney is almost like a sweet salsa. I do wish they gave a couple extra cups of it. I also had an order of half fries and half onion rings. These were freshly cooked to order, but were nothing out of the ordinary. Next time I'll stick with onion rings and a milk shake. My first meal by myself was at breakfast. I had never eaten at a sit down restaurant by myself in the past... This seemed like the perfect opportunity. The restaurant was packed so I waited for a table. Unfortunately I was sat at a four person table in the middle of the crowded restaurant. Plenty of eyes turned my way, but I still ordered my meal. Lemon poppyseed bread, the skillet breakfast, and a cup coffee eventually made it to my table. The skillet breakfast doesn't look appetizing, but under all that sausage gravy was an open faces omelet with sausage, mushrooms, peppers, tomatoes, and cheese a top a bed of hash brown potatoes. It was a huge plate, but wasn't that great. Honestly, I wouldn't order it again... too much gravy just overpowered everything. It was extremely rich and almost nauseating. The lemon poppyseed bread was the best part. That and a cup of coffee is all I truly needed. Before heading back to Chicago, I was able to stop in at Kelleher's Irish Pub. This place is great for relaxing, especially after a long day at work. Located on the river, it seemed like a very popular venue for businessmen, hospital workers, and the younger college crowd. 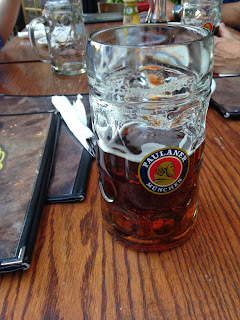 They had a beer special... purchase a 1L stein of beer and if you finish it, the refill is 1/2 price. We also ordered a bunch of food (sorry I did not take pictures of the meal). Personally, I tried the wings appetizers, the beef bites appetizer, and corned beef sandwich. The wings were nothing special, but I liked the beef bites. It gave you the opportunity to try both the corned beef and their Guinness roast beef. The portions are generous and the beer selection extensive. I would definitely be back for a few drinks. With the name Table, Donkey, & Stick, I got the hint that this restaurant would focus on the popular farm-to-table concept. And like most restaurants in this category, their menu changes with whatever is available at the fresh markets. From a rotating selection of cheeses and charcuterie style meats to their unique appetizers, everyone will find something that intrigues their taste buds. I received many recommendations prior to dining here with the best one involving their wanderteller meats and cheese boards. These are absolutely delicious and without question the best part of dinner. They paired nicely with the few cocktails we ordered and all were accompanied by the freshest produce/sauces. Unfortunately, the meal progressively got worse. The appetizer was on the overcooked side and the entree was as tough as rubber. I feel all the attention is given to selecting wonderful cheeses and none to preparing their larger entrees. They do have a beautiful back porch area which I highly recommend dining on, especially on a cool summer day. Even though they had some of the best cheeses/meat boards and a beautiful, secluded atmosphere, the huge misses on the appetizers and entrees gave me no choice but to rate them at 3.5 miles. One of my good friends told me I couldn't miss the wandertellers. After scanning the options, my friend and I decided on ordering three of the meats, meaning we get a toasted baguette with them. We chose (from left to right) the duck liver mousse, the goat sausage, and the smoked trout. All of them were incredible! My favorite was the smoked trout. It was served with sliced beets and a few sprigs of dill. The pieces of trout were thick cut and had a wonderful smokey flavor. And, the dill was the perfect compliment that added a little bite. Now, for the goat sausage, it came with a roasted onion puree. This reminded me more of a salami... so charcuterie flavors were prominent. You have to dip the sausage in the onion puree otherwise it is a little too gamey for most. And finally, the duck liver mousse was without question the richest of the three. The generous portion of mousse was topped with a sweet crumble and a blueberry jam. This mousse needs to be eaten with the toasted baguette to cut some of the rich, irony flavor. The blueberry jam was a little on the sweeter side... I have had a similar dish with a sour cherry jam; it was much better. The crumble added the necessary contrasting texture. Just remember a thin spread of this dish goes a long way. What pairs better with smoked meats and spreads than cheese? We decided on three cheeses: Robiola Rochetta, Anton's Liebe Rot, and unfortunately, I forgot the last. The cheeses came with a few slices of toasted flax seed bread and a couple tablespoons of honey. Without question, this was the second best dish of the night. The robiola rochetta was a mixture of cow, sheep, and goat milk. This cheese had a similar consistency to a creamy brie with more of a grassy flavor to it. Spread a little of this cheese on one of the toasted, flax seed slices of bread and drizzle a little honey. It is unbelievably delicious. The next cheese, the liebe rot, was a cows-milk based cheese. Creamy in texture, but pungent in smell. In fact, I think it would be a little too strong for most. As previously mentioned, I forgot the third cheese we chose. I don't think you could really go wrong with what you choose so my recommendation is be adventurous! The same friend recommended the pretzel fondue appetizer. And once the waiter recommended the same dish, we knew we had to try it. The dish was simple... a fresh baked pretzel with rock salt and a cauliflower gruyere cheese dip. They call it fondue, I call it cheese dip. Anyway, the pretzel arrives at the table still warm with the perfect balance of butteriness and saltiness. Unfortunately, that is where the positives of the dish ends. The cheese dip itself tastes like cauliflower... not one trace of gruyere flavor is left. And the cauliflower flavor isn't even that good. We enjoyed using the pretzel to eat some of the duck liver mousse rather than finishing that strange veggie cheese. The frog leg appetizer was one of the stranger items offered at Table, Donkey, and Stick. The legs themselves weren't strange, but the other ingredients were. The frog legs were paired with a bacon jam, thinly-sliced fried green tomatoes, pickled garlic gloves, and blueberries. The best part of this dish was the contrasting textures and flavors... in one bite, you get sweet, savory, meaty, creamy, and crispy. The concept was amazing, but the execution fell way short. My friend and I both found the frog legs to be tough, meaning overcooked? The fried green tomatoes was nothing but batter and crispy... no tomato substance behind it at all. The blueberries were sloppily scattered on the plate and the bacon jam was more essentially a fatty tablespoon of chopped meat. Yes, I will say eating them in all one bite was tasty, but the components, themselves, were just average. This may be one of the most disappointing dishes we both tasted in a while. The grilled pork loin was one of the entree portions we decided to share. The dish itself consisted of about eight slices of grilled pork loin served with grilled creamed kale, roasted beat slices, olives, and a kola nut jus. The pork was as tough as shoe leather with not much flavor besides salt. Honestly, I didn't even want a second slice of the pork. Luckily, the dish's accompaniments were much better. And in fact, the grilled cream kale was delicious. It was an interesting play on the classic creamed spinach. The grilled flavor was prominent and cut some of the overly salted meat. The kola nut jus had a strong earthy, almond flavor. I don't really know how it helped the dish, but it didn't hurt it either. - DO order the Wandertellers and the Cheeses. Without question the best part of the meal. Next time I will be ordering just these with their cocktails. - The Manhatterhorn and G&T are great summer cocktails. - Outdoor sitting is available. The patio is perfect for a cool, summer day! Photos and posts are to be used only by Eating for Sanity and Joseph Esparaz unless specified. Picture Window theme. Powered by Blogger.